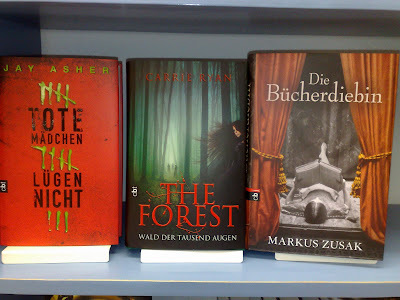 Since my post about English books in German translation was so popular last week, I went back to my local bookstore and took some more pictures. First up, a lot of creepy eyes! Next Wednesday I will post some adult titles. Any requests? Today's question from Wendi is in honor of Banned Books Week: Do you have any banned books in your Library? If so, how many? Do you remember having any strong reactions or feelings when reading these books? Were any of the books on the list particularly surprising to you? I have 20 books in my LT library that correspond with the books listed in the BannedBooks LibraryThing account. Since I haven't listed ALL books that I've ever read in there, I'm sure there are a great deal more. A Clockwork Orange by Anthony Burgess. I read this while on vacation in Burma and I remember it taking a while for me to get into it. I can understand that the violence would turn a lot of people off. My memory of it now is so intermingled with Stanley Kubrick's movie version that I can't really separate them. What strikes me about the book version is the 21 chapter, which was omitted both from the movie and American versions of the book prior to 1986. In it, Alex has finally reached the age of adulthood (21) and renouces his former love of violence - obviously a radically different ending. Naked Lunch by William S. Burroughs. This is one of my least favorite books of all time. I kept waiting for something interesting to happen but it was all this drug induced stream of consciousness nonsense that I strongly disliked. I can't believe I even finished it, though I guess I read this at a time when I finished all books I started no matter what. Native Son by Richard Wright. This was assigned reading in my high school American Lit class. I know some of the parents complained about this one (not mine). I don't remember too much about it now, but the disturbing scene where he stuffs the girl he accidently killed in the furnace is one that is burned in my memory. Olive's Ocean by Kevin Henkes. I read this last year and I'm very puzzled as to why someone would want to ban this. I don't recall there being any objectionable content. 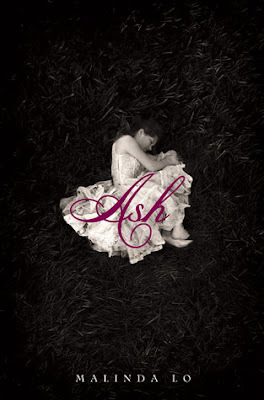 It was just a sweet book about a pre-teen girl being confronted with death for the first time. 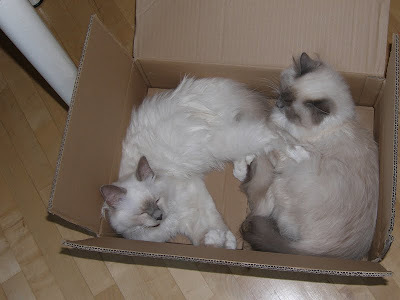 Whenever we bring a new box into the house, the kittehs must try it out. Usually one at a time, but we recently caught them sharing nicely. Philomena, nicknamed Pip by her competitive swimming teammates, shows talent in the pool but at little else. Beset by family tragedy, she throws herself into improving her times and catches the attention of legendary coach Ernest K. Mankovitz who trains her for Olympic gold. But what happens after the glory when she finally has to face her demons? As someone who got my Red Cross advanced swimmer certification at 11 and who watches every swimming world championships and Olympics without fail, I thought I would love this story about a Kansas girl made good. I didn’t. In fact, I found myself getting very impatient and annoyed with the stream of consciousness first person narration and the heavily stylized, fragmented prose. Author Keegan never made me care about any of the characters besides Pip and dwelt way too long on Pip’s tragic childhood – there’s nearly 100 pages of irreverent but often incoherent musings on death, religion and not getting her period before Pip starts taking swimming seriously (although I did like the first chapter where Pip swims confidently at 9 months old). And then Pip’s actual rise to greatness feels very muted. We do get a lot of training details and Pip’s struggle with sugar addiction (hey – I can relate), but the championships go by in haze. We don’t even know what races she competes in – a strange omission indeed. And I know this is fiction set in a fictional swimming universe, but the novel makes a big deal about the East German swimmers being gone by the 88 Seoul Olympics when in fact they dominated, getting 10 of the 15 available gold medals. And don’t get me started on the downer of an ending. This one just wasn’t for me after all. SWIMMING is now available in hardcover. Just a quick note to congratulate Bonnie for winning TIME OF MY LIFE by Allison Winn Scotch and to jpetroroy and Rhiannon Hart for winning signed copies of THINGS ARE GONNA GET UGLY by Hillary Homzie. To claim your prize, just send me an e-mail with your mailing addresses (lenoreva at hotmail dot com). Thanks! 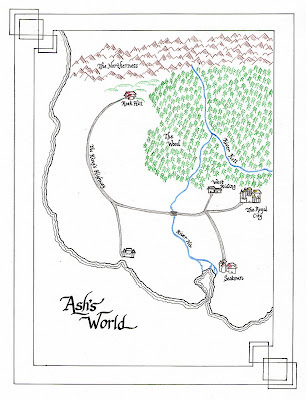 To those who didn't win, there are still two open contests (see my sidebar) for a copy of ASH by Malinda Lo and a signed hardcover of FIRE by Kristin Cashore. Henry recalls the Labor Day weekend in 1987 when he was 13 and escaped convict Frank stayed for awhile at his house with him and his agoraphobic mother Adele. Overall this is a moving story about the experiences and people that have a part in shaping your identity. Although Henry was certainly a capable narrator, he was rather detached from the emotional core of the story – the tender relationship that develops between the two broken adults. I would have loved to get inside Adele’s head and see at least some of the story from her point of view. This gem of a novel is out in hardcover now. Find out more about it at the author’s website. 1. Lauren Mechling is having a contest at her blog for a boxed set of 6 books from Betsy-Tacy's high school years. Lauren describes this classic series by Maud Hart Lovelace as Little House on the Prairie meets Gossip Girl. Ooooh! 2. The Bad Boy Bonanza is still going on...and there are so far only 9 entrants and 8 guaranteed winners. That makes your odds of winning fab prizes VERY good, and all you have to do is preorder Becca Fitzpatrick's HUSH HUSH which is going to be amazing anyway. What are you waiting for?! 3. Laina of Laina has too much spare time, really does have too much spare time because she was nice enough to offer to program a three column layout for my blog, which I've wanted for a very long time. However, once I uploaded it, Daniel noticed that he'd have to adjust my header, so it is back to the 2 column layout for now. Thank you Laina! You're the best!! 4. 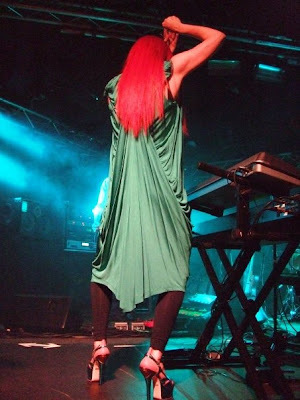 My first Tori Amos concert of this tour was in Basel. I had a 6th row ticket and got an amazing setlist including Girl (the first performance in 6 years - my jaw dropped), Josephine, Pandora's Aquarium, Siren and Curtain Call. 6 of the songs were debuts for me which is amazing considering this was my 11th show overall since 1996. I have now heard every song from Little Earthquakes live! 5. And then it was on to Zurich. This wasn't my favorite setlist, despite 4 debuts (for me). Still, lovely performances and a FRONT ROW seat (thanks to an upgrade) made this an amazing show. I never get tired of Hotel, Tear in Your Hand, Mother and Space Dog. And I loved hanging out with Rachel and Steve who are following the entire European leg of the tour. 6. Last minute, I decided to drive to Luxembourg (3 hrs away) to see my first general admission Tori show. Because I got there 5 hours early (just missing out on meeting Tori herself), I was able to get front row and was thisclose to Tori the whole set. Highlights were Juarez, Smells Like Teen Spirit, and a rocking Raspberry Swirl. No debuts for me this show (the first time that's happened in 13 shows), but I did hear her soundcheck Northern Lad and Cars and Guitars while I was outside waiting...does that count?! Rahib did a very thorough run-down of the whole show experience on his blog if you are interested. How about you? What are you excited about this week? I am going to do a full review closer to the March 2010 publication date, but I just have to say now I am stunned by how amazing this novel is. Definitely one for my all time favorites list. In case you don't know the premise, it's a doozy: Popular high school senior Sam dies but then keeps coming back to relive the day of her death until she realizes she may hold more power than she ever imagined. Small changes in her routine shuffle the cards and produce different outcomes while bigger changes give her fresh insight on her family, her friends, her classmates, and which boy she should have been kissing all along. At the beginning, Sam was so unlikeable, I was terrified I wouldn't like the book, but I need not have worried. Sam probably experiences the most growth of any character I've ever encountered, and I love how chaos theory was so seamlessly integrated, giving the story an impressive depth and enough unpredictability to make it edge-of-your-seat, stay-up-all-night perfect. This is one of those novels that you hold close to your chest after you're done and are just thankful that you had the chance to read it. Not only is it amazingly creative, but it also makes you want to be a better person. Today Adele of Persnickety Snark is hosting me at her blog as part of her international blogger celebration. Head on over to check out what I had to say about the state of YA in Germany and also to read about bloggers from all over the world. 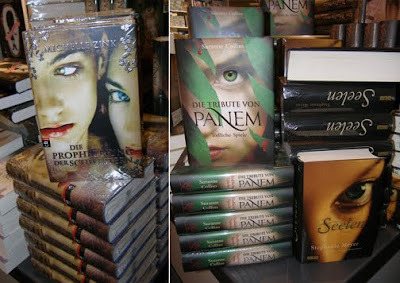 I thought I'd also take this chance to show you a few German versions of US books that are on the loose here in Germany. What do you think? Should I track down more German versions and post them on my blog? Today's question from Wendi based on an idea from Caite: Have you explored/used the Wishlist collection on Library Thing yet? If so, have you found it helpful? Do you have any other tips or uses for the Wishlist collection? This is the first I'm hearing about it, and I have so say, I am VERY excited about it. I love the fact that you can keep your wishlist separate from your main library and that you can make private comments about who recommended the book to you. I am definitely going to be using this feature in the future. The last book I wanted to add to my wishlist was Lucy Christopher's STOLEN, and I have to admit, I've already forgotten whose review it was that sold me. BAD! And now for the Emmy and Finn show... Check out how Emmy holds Finn down while she bathes him. Hilar! This blog tour is all about getting to know the characters of FIRE. Click on the graphic above to follow the entire tour. FIRE comes out October 5th and as a companion novel to GRACELING (which I haven't read yet), it is getting a ton a great buzz. And I'm happy to report that the buzz is well deserved. FIRE is about a "monster" human teen girl named Fire who is trying to live down her father's cruel reputation while trying to help the king avoid a disasterous war in their country with her special powers which include mind reading and persuasion. And I have to tell you, I loved spending time with Fire. Despite being the most powerful being in her world, she has a vulnerability and a fierce sense of loyalty that make her relatable and appealing. "Queen Roen was wife to that loser, Nax, but she doesn’t waste time on regrets. Today, from her fortress in the northern Dells, she dispatches aid to any and all who wish for peace. She has two sons; she has a lot of enemies; she has a cool white streak in the middle of her hair; and… hmm. She has some secrets…"
Intrigued? How about reading the sampler? And if that doesn't get you, how about a signed hardcover copy of FIRE sent to your US or Canada address? To enter to win, all you have to do is a leave a comment telling me about a character in a book recently that you loved and wish you could spend more time with. Contest is open until October 3rd at 11:59 PM. Good Luck! And I hope you enjoy FIRE as much as I did. This review period was very ARC heavy in an attempt to whittle down my review pile. Next review period I hope to have a better balance between bought books and ARCs. Let's see! Where do most of your reviewed books come from? See also my post about the sources of my previous 20 reviewed books. Hunger Games Movie fan casting & A bunch of contest winners! Thanks for all your casting suggestions for the Hunger Games movie. I loved your ideas for Haymitch which included Nathan Fillion, Robert Downey Jr., Bill Murray, Brendan Gleeson, and Jack Black. I'm sure any one of those could pull off this important role, though I have to say I am most intrigued by the idea of Jack Black. A lot of people liked Dev Patel or Alex Pettyfer for Peeta (maybe too wild of an image?) and Ben Barnes for Gale (maybe too old at 28?). Katniss was harder - though Dakota Fanning was metioned quite a bit, I just can't see it, even if she is a great actress (and the right age). Oh, and can I say I pictured Cillian Murphy as Cinna the entire time I was reading? But you want to know the winners of my big CATCHING FIRE contest right? Congrats to My Friend Amy (Team Peeta! ), Rylie (Team ?) and Nonie (who is a huge CF fan, and on Team Peeta as you can see here). 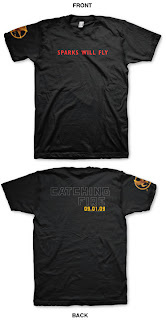 You have all won a copy of Catching Fire, a limited edition t-shirt and a mockingjay pin. I also had a huge STOLEN ONE contest generously sponsored by the author Suzanne Crowley. 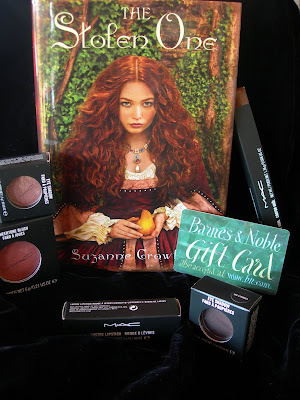 The winner of the book, $75 worth of MAC make-up and a $25 gift card to Barnes & Noble is: Katie of Sophistikated Reviews! We can't wait to see you model the make-up on your blog. You will do that won't you?! Please?! Runner-up and winner of a copy of the novel is: Liz of Booklover. Finally, the winner of DREAMING ANASTASIA by Joy Preble is Cherie J. All winners please contact me at lenoreva at hotmail dot com with your mailing address to claim your prize. If I don't hear back from you within 3 days, I will choose new winners. Thanks! To everyone else, there are still a couple of open contests - see my sidebar for details! My main goal for the upcoming blogging year is to....keep blogging. Seems like a no-brainer right? But I've been hit with blogging burnout in a big way and several of my go-to blogs haven't updated in ages (sparking feelings of sadness but also a tiny degree of envy). The biggest reason for my burnout is simply this crushing sense of obligation I have to get to certain books that have come for review. I'm afraid to count them, but yes, I am very, very behind. I hate letting authors down though, so if you are an author (or publicist) who sent me a book ages ago and I still haven't read it and you still care that I get to it, please e-mail me (lenoreva at hotmail dot com) and I will put it on the front burner. As I strive to reach a better balance of review books, bought books and classics borrowed from the library, some review books may have to wait a very, very long time to be picked up. In any case, I will still be attemping to continue to post at least 3 book reviews a week most weeks. 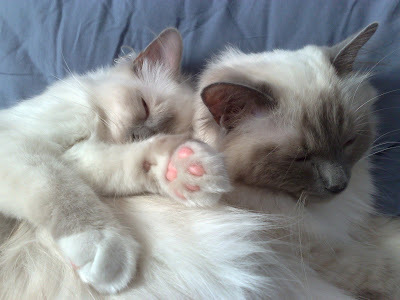 And of course, I will still feed your Emmy and Finn addiction on Tuesdays. Though it is still a ways off, I want to let you know now that I will be taking a blog break for two weeks in November while I am in Africa. Thank you for your continued support of my blog. It's really all the friends I've made and the awesome sense of community that keeps me going, even when the going gets tough. Before her radical reinvention, Taffeta, leader of Cambria Middle School's popular clique, used to be a nerd named Ernestine who liked reading about unicorns and getting good grades (the horror!). When Taffeta is caught cheating, her teacher gives her the option of making a fresh start. Little does Taffeta know that it involves a reverse transformation back into how Ernestine would be if Taffeta had never existed. Taffeta is one of those characters that is so annoyingly self obsessed you actually wish her ill, so that makes reading about her transformation to a social zero all the more satisfying. Of course this a novel about redemption and true friendship so obviously Taffeta learns her lesson having to slum it as poor nerdy Ernestine. As predictable as the book may be, it still feels fresh and fun thanks to the breezy prose and an interesting mix of supporting characters. Tweens whose families are feeling the crunch of the current economic crisis will also identify with Taffeta's attempts to deal with her economically downgraded life. THINGS ARE GONNA GET UGLY is out now in paperback. Watch the book trailer and find out more about the book at the author's website. 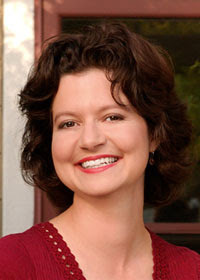 Author Hillary Homzie also answered some of my questions! How did you come up with the character of Ernestine/Taffeta? I came up with Ernestine/Taffeta while I was taking a class on fairy tales at Hollins University Graduate Program in Children's Literature. The professor, J.D. Stahl, asked the fiction writers taking the class to adapt a fairy tale. I chose King Thrush Beard, one of my favorite stories, which is about a spoiled princess who harshly mocks every suitor who comes through the palace doors. When the king marries her off to the next beggar who raps on the castle gates, the princess's life is utterly transformed and she learns to work hard and be appreciative. I wanted to a create a contemporary young teenager who encounters an equivalent reversal of fortune, and show how this transformation actually helps her to re-align her priorities. In Taffeta's case, her life changes economically, physically and socially. Did you create a character profile with stuff that didn't make the book? I have a tendency not to create classic character profiles, where you list traits. Instead, I love to interview my characters and ask them directly about their life, habits, likes and dislikes. Perhaps, this is because in a former life, I was a journalist and so interviewing feels natural to me. I will do this multiple times and find out all kinds of information that doesn't end up in the book. My characters get very opinionated and will ocassionally tell me to stop bugging them. It makes me feel like their parent. For example, Taffeta really loves dogs and during lunch at school she once rescued a stray dog and found a home for him to adopted into by standing in front of Petco with him. What was left in the book about her love for canines was how much she misses her dog who has passed away. Another character trait is that Taffeta thinks she wants to be the person who comes up with names for new cosmetic products. I think there is one place in the book where she mentions this. In actuality, she's come up with dozens of names for lip glosses, such as autumn bliss. What advice would you give to parents and their tween/teen children who are struggling with the economic downturn? When I wrote Things Are Gonna Get Ugly I truly didn't have a crystal ball but now it sure feels like it. Taffeta like so many tweens/teens and their parents are dealing with a shrunken economy, which translates into big changes. I know that this is something that my family is personally facing. I would say that, although having parents who are losing a job or having to cut out lots of spending can feel painful, it's also an opportunity to re-assess what is really important. Instead of buying plastic baggies, you can pack your lunch in sandwich boxes. Instead of going somewhere far away you and your family can get creative and plan a staycation. Consider cutting out cable bills and instituting family read at night or renting videos from your local library. It's also a great opportunity to learn about compassion. If you're losing your house, and moving to an apartment I know that it is not easy but still there are those who have no roof over their heads. Now is the time to visit a soup kitchen and feed the hungry. You still be the life of the party and not be Ms. Money Bags. I have a friend who doesn't have a lot of money but she's one of the most popular people that I know. She's always having parties at her house--she just does potluck and doesn't try to impress anyone. In some ways, when you're broke you no longer have anything to lose because you've lost it all. You don't need to impress anyone and this allows you to be yourself. This is the time to re-evaluate. Who are you? What do you really want and then go for it! After college you traveled through West Africa and had some crazy adventures. Do you still have some wanderlust? Where would you most like to visit? Yes, I absolutely do! In fact, the summer before last, my family took a three month sabbatical. For half the time, we lived in Barcelona, Spain and for half the time in Toulouse, France. It was absolutely amazing. We did it by exhanging our house in California for houses in Europe so all it cost was the airfare. It was great because we felt like temporary residents as opposed to conventional tourists. Next up, I'd really love to go to Australia. Last year, we had an exchange student from Tasmania so I have all of these wonderful postcards just beckoning me down under. Also, I have a special fondness for the country since ABC Australia purchased 36 episodes of the animated version of my chapter book series ALIEN CLONES FROM OUTER SPACE! What's up next for you? Any new projects in the works? I will have a new book out, THE HOT LIST, which is another tween novel and will also be published by Simon & Schsuter's Mix line. That should be out next year. I also have in the works some older YA projects, as well as middle grade projects that I'm very excited about. The later two involve quite a bit of research, although they are contemporary. It's a blast going out into the field so to speak. I actually did that for THINGS ARE GONNA GET UGLY. In order to write the dance scene, I went to a middle school dance and tried to blend into the walls. Walls with big ears, that is. Being a writer is an excellent job for a professional snoop! Hillary has kindly offered a signed copy of her book to 2 lucky readers as part of BBAW. Just leave a comment on this post about the interview to enter. Contest will remain open until September 24th at 11:59 pm and is open internationally! Gain an extra entry by linking to this contest from your blog (sidebar is fine) or social media site. I am joining BBAW here mid-week after visting Basel and Zurich the past few days. I'll post about my Tori Amos concert more extensively on the weekend, but the short version for those who care is that I'm still waiting for Northern Lad, but I was incredibly lucky and got upgraded to front row at the Zurich show (thanks to Rachel and Steve who are attending every European show) and it was beyond words amazing! In Basel, I was row 6 which was also spectacular. Great set lists and energy for both shows. I missed posting about my favorite blogs though, and I really wanted to do that. So I will soon. Better late than never right? And my interview partner and I had some timing issues, but if you are dying for an interview with me, here's my interview from last year at Literary Escapism. I don’t write in my books, but I will rip off a piece of paper to mark pages with quotes I like. I grab whatever’s handy and use it as a bookmark. Dog-ears are a big no-no. I might lie a hardcover flat open, but never, never a paperback. I hate spine creases. Mainly fiction, but I do enjoy non-fiction as well. I cannot pay attention to audio books. I get too lost in my own thoughts when I am not actively engaged by the act of reading. I can put a book down in the middle of a sentence! It rarely ever happens that I come across a word I don’t know when I read in English. But when I read in German or Spanish, I will look up the word if I feel it’s vital for my understanding of the story. I’m between books! I just finished a middle grade novel that I’m reviewing tomorrow – THINGS ARE GONNA GET UGLY by Hillary Homzie. And I’m just about to start Thomas Randall’s THE WAKING: DREAMS OF THE DEAD because I need to get my questions in for an author interview. I bought a bunch of books at the same time and you can see all of them here. The last impulse buy I made was TOKYO CANCELLED by Rana Dasgupta, but I haven’t read it yet. It's about 13 people stuck at an airport who tell stories to pass the time and looks really fascinating though it got mixed reviews. One novel at a time, but I might have a short story collection going and a non-fiction read in addition to the novel. Any spare moment I can find. Seriously. 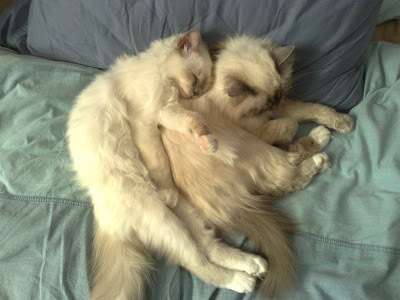 But I like it best when it's someplace I can snuggle up with my fluffy kittehs. Stand alone. Though series can have their charms too - as long as they avoid cliffhangers. David Mitchell – especially GHOSTWRITTEN. HUNGER GAMES and all my other dystopian favorites of course. I am forever lending out Lemony Snicket. French noir writer Sebastien Japrisot’s stuff, especially TRAP FOR CINDERELLA. My YA favorites this year have been IF I STAY by Gayle Forman and DUST OF 100 DOGS by AS King. As for classics, HEART OF DARKNESS by Joseph Conrad and THE AWAKENING by Kate Chopin. My books are organized roughly by genre, though my husband would claim that they are disorganized. I'm in Zurich today, so in case I don't have an internet connection and can't do LT Tuesday, at least you still get your Emmy fix! Despite Jillian's seemingly perfect life - a successful husband, an adorable daughter, and a home that could be photographed for a magazine - Jillian can't help wondering where she'd be if she'd done things differently, especially when she hears that her ex-boyfriend Jack is getting married. And then, somehow, Jillian is transported back in time 7 years to her life with Jack. Can she make the relationship work this time? Or are some things fated? The time travel hook of TIME OF MY LIFE reeled me in, and the incredibly light and yet deep story kept my rapt attention. 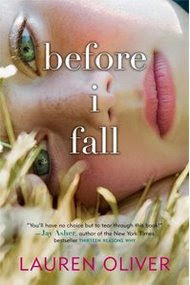 The beginning chapters are a lot of fun as Jillian relives moments from her past, sidestepping arguments with Jack, presenting perfect campaigns for her advertising job, and really cherishing time spent with her friend Meg who is supposed to die in an accident a few years in the future (one of the most touching subplots). I kept waiting for Jillian to bet on the Superbowl or buy stock to make herself rich, but the farthest she goes is impressing people with her knack for knowing who gets kicked off Survivor next. I don't know if you have to be married a couple of years for this one to really speak to you, but I've been married for three, and it really spoke to me. It made me think about the importance of communication, expectations, and compromise. A stunning read. TIME OF MY LIFE is out in paperback now. Find out more about it at the author's website or the author's blog. This has been part of a TLC tour. Since I bought the book myself, the publisher is offering a copy to one of my readers. If you want it, just tell me in the comments what you would try to change about your life if you could go back 7 years. Contest is open to anyone with a US or Canadian mailing address and will stay open for one week. 1. Daniel created a new header for Karin Librarian and she posted her thanks. She also tracked down and posted the first online image of the Buffalo from Daniel's forthcoming picture book IS YOUR BUFFALO READY FOR KINDERGARTEN? So exciting! 2. Tina of Fantastic Book Review and Kim of The Book Butterfly have come up the Bad Boy Bonanza - a mega giveaway to celebrate the release of Hush, Hush by Becca Fitzpatrick. A bunch of bloggers and authors are donating books and swag for the prize bucket. Since my favorite bad boy this year has been Sin from Nina Malkin's SWOON (my review), I'm donating a hardcover copy of said tome. Head on over to join in the fun and win yourself some books featuring bad boys. If you need some bad boy inspiration, also check out Adele's recent blog post on Persnickety Snark about her favorite bad boys of YA. 3. 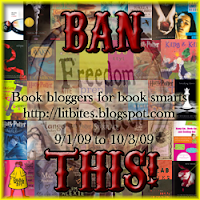 In honor of ALA's upcoming banned books week (Sept 26th-Oct 3rd), Donna of Bites is hosting a theme month about banned books. I'm planning on finally reading Fahrenheit 451. There is still time for you to join in! Check out her blog for details. 4. A very special writer friend of mine just signed with an agent! I'm so happy for her! 5. Book Club Part 2: Next week my new and improved (and non-paranoid) book club is meeting for the first time. We each plan to introduce one of our favorite books to the rest of the group. I'm sure I'll have a hard time deciding which one of my many favorites to talk about. 6. I'll be attending two (possibly three) Tori Amos concerts this coming week. Please keep your fingers crossed that I'll finally get to hear Northern Lad performed live and in person. I found out I was shortlisted for Most Eclectic Taste shortly before getting on a plane and heading back to Germany, so I was unable to immediately react and express my excitement. After being nominated for a flurry of awards in the initial stage, I am of course thrilled that at least one stuck. So…do I fit the category? Does my blog? I like to think I have eclectic taste – I generally won’t turn down a great book just because it is in a genre I don’t usually read and I have been actively seeking out reads from less frequented genres as well. These are the posts (all reviews) that I submitted for the category that reflect a range of genres from humor, speculative fiction, short story collections, non-fiction, children’s picture books, paranormal romance and literary fiction. I could have also chosen to highlight reviews of historical fiction, Christian fiction, health & beauty, or mystery and thrillers. It’s true that while my focus is YA and literary fiction, you never know what genre might pop up on my blog. So am I the book blogger with the most eclectic taste? Now it is up to you decide – go to the BBAW awards voting booth now! I’ve gotten a number of mails expressing outrage and disappointment that I didn’t make the best YA blog shortlist like I did last year and complaining about some of the ones that did. While I’m flattered that you all care so much, I don’t think anyone needs to “boycott BBAW” because of it. First of all, BBAW is NOT just about the awards, which are just a tiny part of the whole celebration (check out the BBAW blog for all the events that will be going on and ways you can get involved). Secondly, the 5 blogs that did shortlist in the YA category are all solid, deserving blogs that I read regularly and enjoy a great deal. Yes, my personal shortlist would be pretty different, but this a community process, and the community has spoken. Thirdly, the fact I didn’t make this particular shortlist is my own fault. How? I simply ended up chosing the wrong links to submit – my chosen 5 were too long (most likely exasperating an already tired panelist), 4 out of the 5 were book reviews (perhaps perceived as not diverse enough), and none included pictures or video other than the book cover (probably earning a deduction). I realized this as I was reading through the posts submitted in the panels I was judging and going through the line item scoring. You see, I submitted links not realizing the sheer amount of work the BBAW awards would turn out to be for the volunteers involved (way more than any of us on the awards committee ever bargained for – or we would have set it up differently, I assure you). In order to carefully read through every post submitted in most categories, BBAW awards panelists would have needed DAYS of reading blogs – time that most of us just did not have. Add the fact that some panelists were on more than one panel (I was on three, chairing one), and you get an idea of the immensity of the project. And so, judges needed to skim at times and to develop shortcuts. Now, I don’t speak for any of the other panelists of course, but I can tell you a few of my own coping mechanisms. For line items with a scoring value of 10 (such as quality of writing, originality, diversity of content, and fresh perspective) I assumed a start value of 7 (indicating an average blog). If a blog struck me as particularly good (or bad), I would add (or deduct points). I also had a few automatic deductions. For example, if a blogger used the publisher summary in a book review instead of writing their own, I took off points for originality. If the summary went more than a paragraph, I deducted points off for not being concise. If the background of a blog was black or another dark (or too bright color), I could not say it was “easy on the eyes”. I know there have been some complaints about nominated blogs not seeming to fit the category they were nominated in. Based on the line item scoring of 5 eligible posts, there was no way to disqualify blogs which submitted 5 posts that fulfilled the category requirements even if their focus lies elsewhere. This is obviously not how every panelist approached judging, but I hope it shows what a time-consuming task it was and how we tried our best to be fair and consistent across judging. The system certainly wasn’t perfect, but I think we did end up with a fairly representative cross sample of the amazing book blogs that are out there. I bet by visiting some of the shortlisted blogs, you will find some new favorites. I know I did. And if you have any specific recommendations for how the awards process might be improved for next year, the awards committee welcomes your input. There will be a form at the end of BBAW that you can fill out, or if you need to get it off your chest now, feel free to e-mail me (lenoreva at hotmail dot com), Amy, or anyone on the 2009 awards committee. PS: For more insight into the judging process, see this fab post over at the Book Smugglers. Today's question from Wendi asks: Have you explored the Series feature of your Statistics? Were you surprised by how many series you have/haven't read? Were your series mostly complete, or did you find that you had only read one book from a lot of different series? What was the largest number of books in a series? I just now explored the series feature and noticed that it wasn't very accurate - because I haven't entered a lot of books I've read. I have, for example, read every book in the Chronicles of Narnia (7 books) and A Series of Unfortunate Events (13 books), but have only entered the first book of each into LT. I have also completed Scott Westerfeld's Uglies trilogy, Stephen Lawhead's Pendragon Cycle, Melissa Walker's Violet trilogy, and have one more book to read in Jasper Fforde's Tuesday Next series, Shannon Greenland's Specialists series, and Eoin Colfer's Artemis Fowl series. And I certainly can't forget the hundreds of Babysitter Club, Sweet Valley Twins/High, Nancy Drew, and Lois Gladys Leppard's Mandie books that I read as a kid. There are a ton of series I've started or read the first two books of lately as well. Just got back to Germany this morning, and have pictorial evidence that when I'm away, the cats will play. 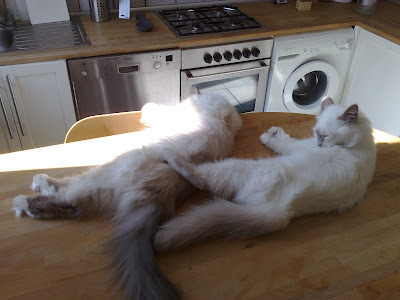 Took over the kitchen table while I was gone did you two Sacred Birman kittehs? There is something so fascinating to me about the Elizabethan era and about Queen Elizabeth herself – her story, her manner, and all the intrigue that surrounded her life. Although we hear a lot about her, there is still something profoundly mysterious about her too. 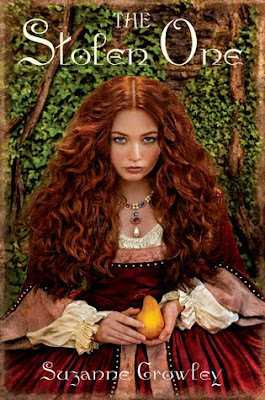 That’s why it is an especially intriguing angle to tell the story from Kat’s perspective – a mysterious red-haired orphan who his searching for her identity and finds it in QE’s court. THE STOLEN ONE is available in hardcover now. Find out more about the book at the author’s website. And come back later today (or tomorrow) for an amazing cover story and giveaway prize pack worth over $100!! Who are the lucky winners of the Bloomsbury 8 book prize pack? Today's question from Wendi: Have you explored the Places feature of your Statistics? Do you have any places that have multiple books listed? If you have multiples, are they from different authors, or from the same series? I just checked this out for the first time today and found out I have 617 places. I didn't get through the whole list (hey...I'm on vacation! ), but I have a ton of books set in Boston, Chicago and England (yeah, I stopped at E). It looks like I am going to have to start adding place facts to common knowledge for my books though, because I do see a lot of gaps! You will be seeing this same contest on more blogs over the next 2 weeks, so try to enter as many as you can, because you WANT to win this one! Read my review of Catching Fire. Visit the official Hunger Games site. All you have to do to enter is leave a comment telling me who you think should play Katniss, Peeta, and/or Haymitch in the upcoming Hunger Games movie. (You can cast all three, but one will suffice). If you haven't read Hunger Games yet, no worries. Just tell me why you want to read it and Catching Fire and you're in. Followers of my blog get an extra entry, so indicate if you are in a separate comment for it to count. New followers are welcome! The Catching Fire book promotion is open to participants with a United States mailing address only (international readers can enter if you have a friend in the States who can accept your prizes by mail!). Entrants under age 13 must have parent or guardian permission to enter. The Catching Fire book promotion runs from September 1 to September 15, 2009. Winners will be announced on or around September 16, 2009.